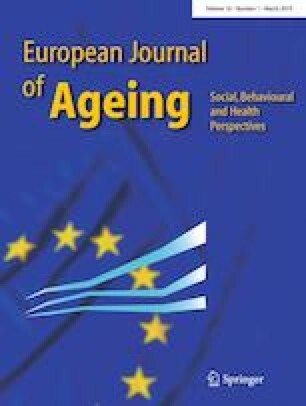 Age integration in older Europeans’ non-kin core networks: Does formal social participation play a role? Age segregation—the widespread separation of people by age—is deemed by many gerontologists a major problem in contemporary societies. Contributing to this dialog, the current exploratory article examines the presence of non-kin members in European seniors’ close personal networks. Specifically, we document network connections to people outside of their 10-year birth cohort, both younger (“downward” age integration) and older (“upward” age integration). We consider whether different aspects of social participation—breadth and intensity of activity, and specific types of participation—are associated with age integration and we pay particular attention to variation across four regions of the continent. Analyses use Wave 6 of the Survey of Health, Ageing and Retirement in Europe (N = 34,282) which contains an updated social networks module. Results of descriptive analyses and logistic regression models demonstrate three key findings. First, both forms of age integration are rare—fewer than 10% of older Europeans have non-kin networks that extend beyond their own cohorts. Nevertheless, both forms of age integration tend to be higher in northern and central Europe than in the south and east. Second, two dimensions of formal social activity involvement were associated with age integration, namely activity breadth and intensity. Third, though there was some evidence that particular formal activities were linked to age integration, this pattern was not consistent across the whole of Europe. Overall, findings point to the significance of cultural and organizational variation across Europe as well as to important and increasingly relevant social cleavages in the later segments of adulthood. See Tables 4, 5, 6, 7, 8 and Fig. 2. Interaction model with: community org.